Ibadan was created in 1829 as a war camp for warriors coming from Oyo, Ife and Ijebu. A forest site and several ranges of hills, varying in elevation from 160 to 275 metres, offered strategic defence opportunities. 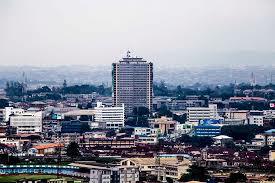 Ibadan is the largest indigenous city in West Africa and is located in the South Western part of Oyo State of Nigeria. It is the capital city of Oyo State and is located about 145 km north-east of Lagos, the commercial capital of Nigeria. Its population of 2,550,593 according to 2006 census results, includes 11 local government areas. The population of central Ibadan, including five LGAs, is 1,338,659 according to census results for 2006, covering an area of 128 km². Ibadan is a city built on seven hills. It was founded by the Yoruba in 1750. It became a Yoruba military headquarters in 1929 and came under British rule in 1893 as part of the Niger River Delta Protectorate. Ibadan had no “ancestral father” or founder; it only maintained an indirect link with Ile-Ife which was regarded by most of the older states as their orírun (“original home”), from which their princes obtained the adé ìlẹ̀kẹ̣̀ (beaded crown) that symbolised their right to rule and from which they also developed a spirit of brotherhood that bound a number of Yoruba rulers together. Ibadan was founded by “iron and blood” and right from the beginning a military aristocracy was set up where most of the notable warriors of the 1830s controlled the reins of government. The first leader was Oluyedun, a distinguished warrior who took the title of Àre ̣Ọ̀nà Kakanfò meant for the Oyo war general. His lieutenants and subordinates were selected in accordance with their valour. Lakanle, who had been the commander-in-chief of the Ibadan ad hoc army, then acclaimed “the bravest of the brave,” became the Ọ̀tún Kakanfò while Oluyole who was reputed to be the next most powerful man, was made the Òsì Kakanfò. The reign of Basọ̀run Oluyole from the mid-1830s to 1847 further emphasised that a powerful military leader was in control. He was feared by his subjects and chiefs for his firmness and toughness which was often excessive and bordered on oppression and wickedness. In fact, so well did he succeed that Ibadan became known as Ìlú Olúyọ̀lé (“town of Oluyole”) long after his reign, to this present day. Long-established Ibadan oral traditions speak of “three Ibadans,” the first two being smaller settlements inhabited by some migrants from other parts of Yorubaland, including the Egba Gbagura who were later to move to Abeokuta. Among these people were the descendants of Lagelu, the ancestral founder of the first Ibadan who migrated from Ile-Ife. The first Ibadan disintegrated as a result of destruction; the second suffered from defeat and desertion; and the third has remained in existence ever since. Ibadan began as a temporary settlement and war camp (bùdó ogun) for the allied armies of Ijebu, Oyo, and Ife who had gone to participate in the Owu War. The Egba, Ife and Oyo were the original inhabitants of Ibadan. Egba left in 1829 for Abeokuta while Oyo expunged Ife under the leadership of Máyè ̣Okunade in 1833 and Oyo became the sole inhabitant of the land. In the 19th century, Ibadan offered a natural protection. This was why the settler settled at Oke Mapo (Mapo Hill) and clustered around its brow. Thus, Ibadan was referred to as ìlú orí òkè (the city on the hill). There was no ààfin (palace) centrally located to the town since there was no Ọba. Consequently, the various compounds were not built to look towards the direction of any ruler’s compound as was the case in older towns where houses were built to face, as much as possible, the palace. Instead, they were built on slopes of hills to face whatever direction the owner found convenient and to avoid the ridges where erosion and flooding could wash their houses away. While the people were predominately farmers, some engaged in trading. The central market at Ojaba was the economic nerve centre of the town. Traders from the neighbouring countries of the Egba and Ijebu attended the market at Ibadan, bringing coastal goods like salt, dried fish, and European commodities. Female Ibadan traders, too, left the town to attend the markets in Apomu, Ikire, and some villages in the Ife kingdom. To facilitate the movement of traders entering and leaving Ibadan from different places, the town wall had sixteen gates, all in the direction of the sixteen highways entering the town. The system of many gates was considered unique and described as the first of its type in the whole of Yorubaland. Four of Ibadan’s gates were of special importance because of the traffic on them and the importance attached to their maintenance and security. These were the gates leading to Abeokuta, Ijebuland, Oyo, and Iwo. Both Abeokuta and Ijebu gates linked Ibadan with the coast while the others linked the people with their kinsmen in Oyo-Yoruba towns and villages. The location of Ibadan also favoured trading activities. Ibadan had the economic advantage of being located on a network of communication routes. It could easily be linked with the older Yoruba states and with the ports in Lagos, Porto Novo, and Badagry through the Egba, Egbado, and Ijebu territories. These three ports were important because of the lucrative trade in slaves and later in agricultural products with the Europeans on the coast. Ibadan succeeded in exploiting this advantageous location to establish trade contacts with many other parts of Yorubaland. In less than two decades after its establishment, Ibadan had grown into a big commercial centre. From the small settlement of the 1830s, it rapidly expanded to such an extent that the second town wall had to be built in the late 1840s, and the third in 1858 to protect its almost one hundred thousand dwellers. Ibadan maintained an open door policy to strangers, attracting and welcoming them irrespective of their places of origin. Many were lured into the town by its great commercial potentialities, its liberal and accommodating attitude towards strangers, and the opportunities it provided the hardy and the adventurous to make use of their talents. Unlike the older states which were founded by just a few people and took hundreds of years to grow, Ibadan had a large and rapidly expanding population right from the beginning. This made an impact on the economy. Farmlands had to be rapidly expanded to meet the food requirements of the people. More tools and cloths had to be provided and this led to the phenomenal expansion of the crafts industry. The exchange economy had to be developed too. Ibadan provided an unparalleled security to all its inhabitants and this created in the minds of its citizens a spirit of invulnerability. Anybody who set his foot on Ibadan territory was sure that, except for war or civil rebellion—the two conditions that were capable of subverting peace in Ibadan—he was completely safe from the hands of invaders. For, it was believed “ogun kò lè kó Ibadan” (“Ibadan can never be plundered in war”). Apart from its strategic location which gave it a natural protection, it boasted of many distinguished warriors who could successfully defend the town against attack from any part of Yorubaland. With an expanding economy characterised by a high degree of specialisation, Ibadan rapidly grew into a big, urban centre. This rapid transformation of the town is in line with the “functional specialisation theory of urbanisation” which stresses that an economy based on specialisation and division of labour, as obtained in Ibadan, is capable of transforming a small settlement into an urban centre. Based on this economic theory, its numerous farmers operated far above the subsistence level; its military rulers provided the necessary peace and control over the economy; and its exchange sector allowed for the distribution of surplus local items and imports. Many Ibadan traders grew wealthy by exchanging local products and by participating in the clearing of higher-value goods from different sources. This generated considerable employment for many people as retailers, wholesalers, food sellers, and in other nonagricultural occupations. It also brought more revenue to the military rulers. Thus, by around 1850, Ibadan had become an urban centre with a population of about 60,000 to 100,000 people living within the town, which covered about sixteen square miles. It had also established an identifiable social, political, and economic structure which sustained it for the remaining fifty years of the century. Ibadan (Yoruba: Ìbàdàn or fully Ìlú Ẹ̀bá-Ọ̀dàn, the town at the junction of the savannah and the forest), the capital of Oyo State, is the second largest city in Nigeria by population after Lagos and the largest in geographical area. At independence, Ibadan was the largest and the most populous city in Nigeria and the third in Africa after Cairo and Johannesburg. Its central location and accessibility from the capital city of Lagos were major considerations in the choice of Ibadan as the headquarters of the Western Provinces (1939), which became the Western Region of Nigeria in 1952. Ibadan is the largest city in Nigeria by geographical area. It is larger in size than Ekiti, Abia, Ebonyi, Imo, Anambra and Lagos States. It is more populous than Ondo, Osun, Kogi, Zamfara, Enugu, Kebbi, Edo, Plateau, Adamawa, Cross River, Abia, Ekiti, Kwara, Gombe, Yobe, Taraba, Ebonyi, Nasarawa, Bayelsa States and Abuja, the Federal Capital Territory. And it is more industrialized than Sokoto, Jigawa, Adamawa, Taraba, Plateau, Ebonyi, Ekiti, Osun, Bayelsa, Cross River, Kwara, Kogi, Kaduna, Kebbi, Gombe, Bauchi and Borno States. Ibadan as a city, has 11 local government areas; three more than Bayelsa State and just two less than Ebonyi State. The first skyscraper in Nigeria, Cocoa House, is at Ibadan. Ibadan has the first standard Nigerian stadium; The Obafemi Awolowo Stadium formerly Liberty Stadium. The first television station in Africa is at Ibadan. Ibadan is the cheapest city to live, in South-West Nigeria. Ibadan boasts of the oldest surviving private-owned Newspaper (The Nigerian Tribune). The first school in Ibadan was founded by Rev. David Hinderer at Kudeti (too dirty) in 1853. There are more federal tertiary institutions/institutes in Ibadan than any other city in Nigeria. The busiest highway in Nigeria, Lagos-Ibadan expressway, terminates at Ibadan. The city of Ibadan is naturally drained by four rivers with many tributaries: Ona River in the North and West; Ogbere River towards the East; Ogunpa River flowing through the city and Kudeti River in the Central part of the metropolis. Islam is the dominant religion in Ibadan with the overwhelming majority of the core Ibadan City Center inhabitants being Muslims. Ibadan is the second largest non-oil city economy in Nigeria after Lagos. Agodi Gardens and Leisure Park. Shoprite mall in cocoa house Dugbe. The Palms shopping mall, Ring Road. University of Ibadan Zoological Garden. Brigadier General Raji Alagbe Rasaki (b. 1947), just to mention a few. It is one of the oldest city in Nigeria.